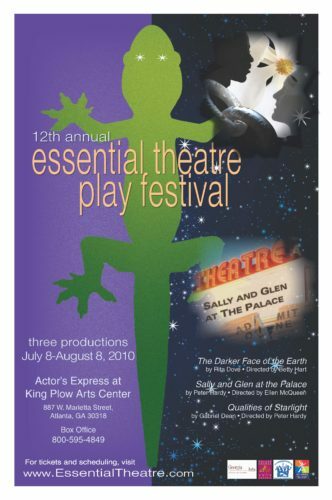 The 2010 Essential Theatre Festival was a big one for us. We did Poet Laureate Rita Dove’s epic THE DARKER FACE OF THE EARTH, and Ms. Dove was gracious enough to come to our opening night! Then we did Artistic Director’ Peter Hardy’s prize-winning SALLY AND GLEN AT THE PALACE, which went on to another production at Out of Box Theater, and Gabriel Jason Dean’s QUALITIES OF STARLIGHT, which went on to four further productions around the country, and is now published by Dramatic Publishing Company.